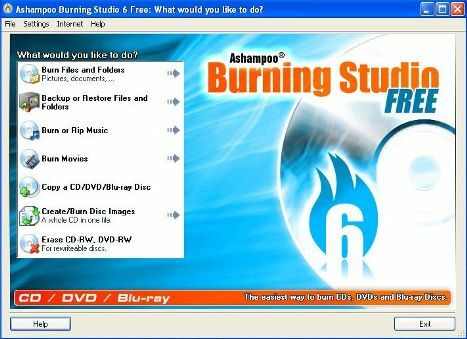 Ashampoo is making available its previously commercial burning software Ashampoo Burning Studio 6 a freeware edition, which costs $19.99. It’s a version older than the also-free Ashampoo Burning Studio 2008 (which is version 7) but with full features unlocked and usable, and do not require any registration. Ashampoo Burning Studio 6 is a simple yet powerful CD, DVD and Blu-Ray Discs burning software with file backup capabilities. Ashampoo Burning Studio 6 features multi-disc file backup and original locations restore on CDs, DVDs and Blu-ray discs with support for compressed, password protection and split backup archives. It has also integrated Audio CD ripper to store audio tracks as WMA or WAV files, able to burn audio CDs from WAV, MP3, FLAC, WMA and Ogg Vorbis files, burn MP3-CDs, Video DVD, Video CD (VCD) and Super Video CD (S-VCD), able to create or burn CD/DVD/Blu-ray disc images, has option for setting the number of copies you want to burn (available for all disc formats) and burn speed, able to verify disc immediately without being ejected first, and of course, make copies of audio, video or data discs and erase CD-RWs / DVD+RWs / DVD-RWs/ DVD-RAM/ BD-REs. The version of the Ashampoo Burning Studio 6 Free is 6.61, a little higher than the version offered to Ashampoo Burning Studio 6.50 which is still not updated and still selling for $19.95 on Ashampoo website. Version 6.61 improves burning engine. No registration of any sort or serial number or license code required to activate the burning software. If you has Ashampoo account, you can add this freebie software into your collection by registering here.